< PREVIOUS Stay Strong and Able With These Advanced Chronic Ankle Instability Treatments | article | NEXT >Hip or Knee Pain? Why You Need to See a Podiatrist. How do you tend to your feet? If you’ve been diagnosed with diabetes, you know that your entire relationship to your body changes. Watching your diet, taking medication, and monitoring your blood sugar – these healthy habits should become a part of your new routine. It’s time to practice optimal diabetic foot care. About 1 in 10 adults in America have diabetes. If you’re not diabetic, chances are you have a friend or family member who is diabetic. They will benefit from the information and recommendations provided below. My father has been a diabetic for over 30 years and I monitor his feet at least once per month. Although he has nerve damage in his feet, he has not experienced any complications thus far. Diabetes causes a type of nerve damage called neuropathy in about 70% of patients. Researchers don’t yet know exactly why this happens, but, according to the Joslin Diabetes Center, it is believed that excess sugar in the bloodstream causes swelling in the cells that cover nerve endings. This pinches the nerves, inflicting lasting damage. As a result, diabetic patients may experience numbness, tingling, and even pain in their hands and feet. 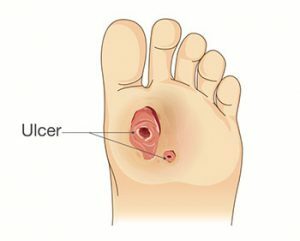 Foot ulcers are common in diabetic patients – and the risks of developing an ulcer can be dire. If you have diabetes, the chances that you’ll develop a foot ulcer at some point in your life are about 1 in 4. And each year in the U.S., diabetic foot ulcers lead to about 73,000 lower-leg amputations. This becomes a major problem when patients don’t take care of their feet. Patients may not be able to feel when they have a cut, scrape, blister or injury. In addition, poor circulation (another symptom of diabetes) can thwart your body’s ability to heal the wound. And, if it becomes infected, the foot can develop gangrene, requiring an amputation. The truth of the matter is that the vast majority of complications and amputations in diabetic patients are avoidable with appropriate patient education, early detection of potential problems, and regular checkups by a podiatrist. You can avoid disruptive outcomes by starting an optimal diabetic foot care routine that minimizes your risk while fitting with your lifestyle. 1. Do inspect your feet every day for cracks, cuts, sores, and other wounds. Even an ingrown toenail or hangnail could grow into a much bigger problem. You can use a mirror, or have a loved one check your feet every night before bedtime. 2. Don’t go barefoot, outside, at the beach, or even around the house. One displaced carpet tack or dropped needle could be all it takes to start a diabetic foot ulcer. Make sure you have plenty of room in the toe box, and protective coverings on all sides. 4. Don’t wear flip-flops, sandals, or old shoes with worn-out soles. Always avoid shoes with seams in the interior, as these can rub your feet and cause blisters. 5. Do dry your feet with a clean towel after every washing. Don’t even think about skipping this suggestion! 6. Don’t skip drying the spaces between your toes. 7. Do moisturize your feet with lotion. Neuropathy inhibits the signals from your brain telling your feet to sweat. Chronically dry feet are prone to cracks, especially if you live in an arid region. Those cracks can expose your feet to germs which may lead to an infection. 8. Don’t apply lotion between your toes. Again, this tightly-squeezed area doesn’t need your help staying moist. 9. Do control moisture with Merino wool, polyester, or other sweat-wicking socks. Again, try to find seamless products to avoid any excess friction. You might want to invest in specially-designed diabetic socks. If you get sweaty, remove your socks and put on a fresh pair. 10. Don’t soak your feet in hot water. This can open up pores and make your skin too soft and fragile, and vulnerable to injury. 11. Do support your feet in comfort with orthotics. Orthotics designed with diabetic needs in mind can be found over the counter or online or you can get fitted with custom orthotics by your foot and ankle specialist. Fortunately, Medicare Part B does cover one customized pair of orthotic shoes for diabetic patients each year. Cigarette smoking constricts your blood vessels, slowing the flow of oxygen-rich blood cells to your feet, and compromising your body’s ability to fight infections. 13. Do keep your blood sugar under control. The higher your blood sugar levels, the more you’re risking nerve damage to your feet. 14. Don’t ignore any corns, blisters, calluses, cuts, or sores. These problems may not be able to heal on their own without medical attention. 15. Do visit your foot and ankle specialist for a regular exam. Your doctor can keep an eye on your feet and provide resources and treatment for numbness, pain, and other foot problems you may encounter. If you are experiencing diabetic problems with your feet or ankles we are here to help. 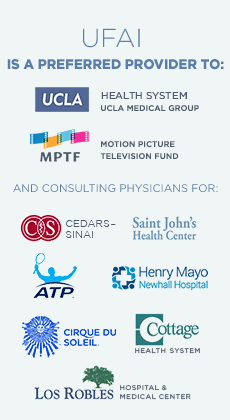 Our nationally recognized podiatrists and foot and ankle specialists offer the most advanced foot and ankle care along with the highest success rates in the nation. The doctors at University Foot and Ankle Institute are leaders in the field of research and treatment of all foot and ankle conditions. Dr. Avanti Redkar is board certified in podiatric medicine and joined University Foot and Ankle Institute under a fellowship in sports medicine and ankle reconstruction. She attended podiatry school at the New York College of Podiatric Medicine and went on to complete her surgical residency at Good Samaritan Hospital in West Islip, New York, where she was trained in foot and rearfoot surgery, wound care, and hyperbaric medicine. Dr. Redkar specializes in foot and ankle pathology and is available for consult at our Mid-Wilshire Los Angeles and Beverly Hills locations. Next: Hip or Knee Pain? Why You Need to See a Podiatrist. This is some really good information about caring for your feet when you have diabetes. My grandfather just got diagnosed with diabetes. It is good to know that she will need to control her foot moisture. She should probably go talk to a podiatrist about things she will need to do. Thanks!